Erasure today announce the release of its 16th studio album this fall, a 10-track record titled The Violet Flame that will be followed by a massive 58-date world tour that will mostly see Andy Bell and Vince Clarke play venues in the U.S. and U.K., but also includes dates in Canada, Ireland, Germany and Denmark between mid-September and the end of 2014. The album, produced by Richard X, follows last year’s holiday-themed collection Snow Globe. It will be released Sept. 23 via Mute Records, and can be pre-ordered in a variety of deluxe formats and packages via Pledge Music beginning 5 a.m. EDT Wednesday. The first single is due out in mid-July, but you can stream a minute-long preview sampler below. 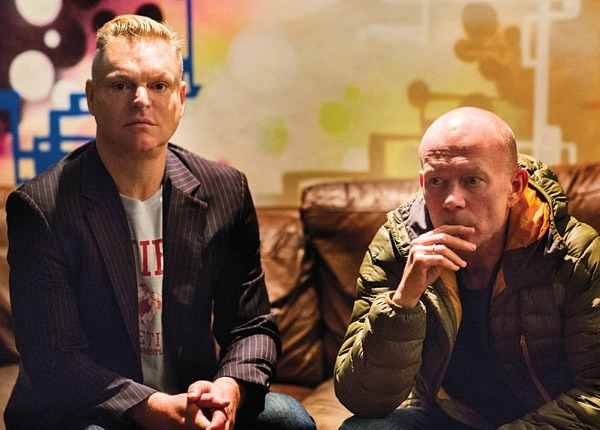 Following two U.K. festival dates in August, Erasure will embark on a giant tour in support of The Violet Flame beginning Sept. 12 in Miami, playing 32 North American dates through Nov. 1, including two-night stands in a number of U.S. cities. After that, it’s off to the U.K. and Europe, with a return to the U.S. for a two-night New Year’s stand in New York City. Tickets for the U.K. and European shows go on sale May 30, while the U.S. concerts go on sale June 7. See full dates below. Just like Depeche Mode’s last tour, no Seattle/Portland dates. I wonder if promoters no longer consider them a draw in the PNW. No Seattle again, sheesh. I don’t blame them, it’s only profitable for them to trek all the way here if they play Vancouver and Portland. The PNW is too far away from major city clusters. Even when the bigger bands come it usually means driving four boring hours to the Gorge and camping out around dirtbags. Yeah, what the guys!?! Why are there no shows Here in Portland or Seattle? Last time Erasure played in Portland, the show sold out in like 5 seconds…….Why aren’t are you guy’s avoiding the Pacific Northwest? Let me clarify….Why are they avoiding the Pacific Northwest? Sorry for the sloppy writing. No coffee yet. Wow! I know the draw is not like SF (I don’t even see an SF date?) but Portland shows, the last few I saw, had a perfectly decent turnout. I don’t get it? Portland LOVES Erasure. The Andy Bell show with MWH and HoJo was not a great turnout due to poor promotion more than likely. I did not see much of anything about it. YES.. PLAY PORTLAND! (At least SF.. “I “might” be able to visit for the show).. but STILL.. PLAY PORTLAND! There’s a massive but more important a loyal fan base in Australia…..been at least 10 years since lash visit.